Depending on where you live, people all over are preparing their homes for hurricanes, tornadoes, floods, Wildfires and more. For many people, this means getting an “emergency bag” ready, keeping your car stocked, and preparing just in case there is an evacuation. Taking your pet with you is the most important thing to do if an evacuation is looming, but there are plenty of other things to do ahead of time just in case you need to evacuate your home. 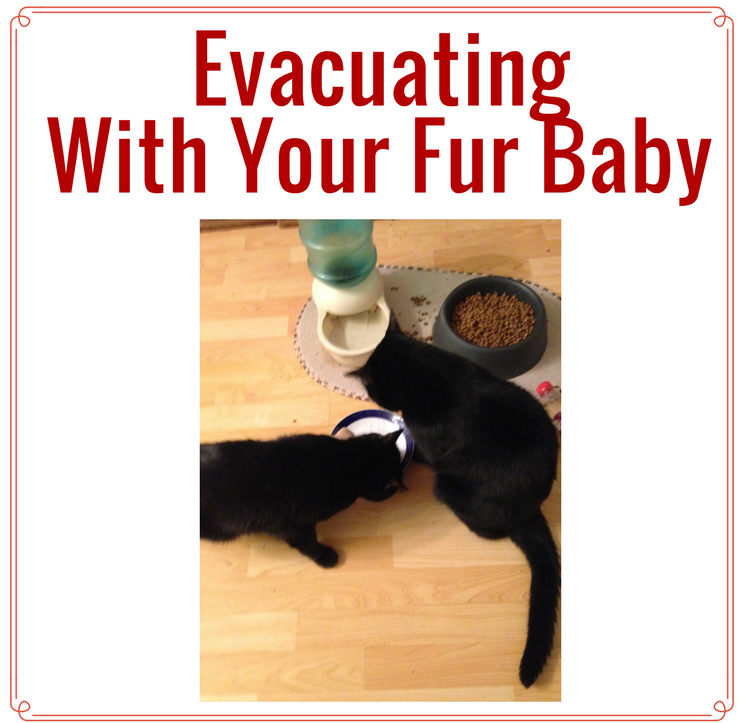 Evacuating can be overwhelming — both for people and for pets — so make the process as easy and painless as possible. Make sure that your pets’ collars and tags are up-to-date. Safe T Pet has personalized pet collars that include the pet’s name and a contact phone number. They also have personalized products like luggage straps, Pet tags, leashes, harnesses and more! You should always have a current photo of your pet in order to identify them if necessary. This won’t be a problem for most pet owners - we take pictures of our pets nonstop ( I think my most current is from an hour ago), but make sure you have one that doesn’t just capture how cute they are, but shows their defining features. If you don’t have a carrier already, purchase a pet carrier for each of your fur babies — write your name and contact information, along with your pets’ name, on the carriers. I know my boys aren’t fans of the carrier – it usually means they are going to the Vet or we are moving, for Waffles and Feisty it is a long process to get them in the carriers. Try to get your pet familiar with the carrier, and practice transporting them in the carrier before an emergency. This will make them more comfortable with being inside the carrier during an evacuation situation. Make sure to have extra leashes and harnesses in the carriers to keep them safe while they’re outside. Some evacuation shelters are not able to take pets. If you plan to stay in a hotel or motel during evacuation, find out ahead of time which ones allow pets. Although it should be a last resort, some animal shelters will provide temporary housing/foster care for pets that cannot be with their humans during times of evacuation. In case of emergency situations, you may not be able to get home before evacuating. Have a designated caregiver. Talk to friends, family, and/or neighbors, hopefully someone who lives nearby and is comfortable with your pets and willing to care for them in a time of need. Many people have emergency kits with the necessary items, but it’s important to have them for pets as well. Pet emergency kits should include enough food and water for two weeks, food and water bowls, medical records, any medications, extra poop bags and / or kitty litter, other clean-up items, and any comfort items your pet might need like a bed, blanket, or toy. This can be a poster or whiteboard posted by the front door. The sign can help in case there’s ever a fire or flood so that first responders know to save your pets. It should include information on any pets that live in the house - How many pets, types of pet, names etc - basic info for the first responders to quickly read and know what to look for. If you have a rescue alert sign and you evacuate your home, write “EVACUATED” on it so that rescue workers know they don’t need to search your house for pets. how to care for their pets during an evacuation!